It may officially be autumn now, but it was still warm and muggy in the park yesterday. The birds didn't seem to mind -- I saw the first white-throated sparrows and juncos of the season, and a few warblers hiding in the foliage. 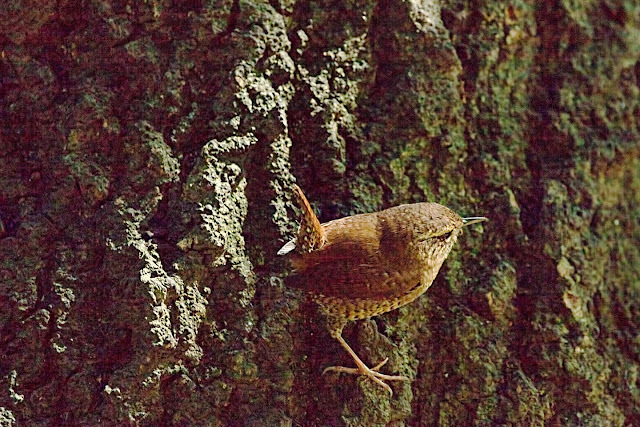 And this winter wren, with that adorably stubby spotted tail at full salute. The light wasn't great so the picture isn't that sharp, but I so rarely see wrens that I'm thrilled with it anyway.